When you're chasing your fitness goals, providing your body with high quality protein around the clock is essential to achieving optimal recovery. 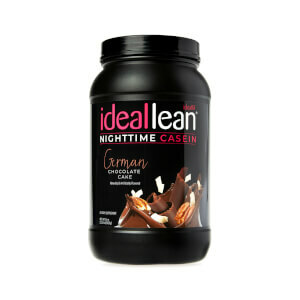 Maximize your lean muscle building potential with IdealLean Nighttime Casein! 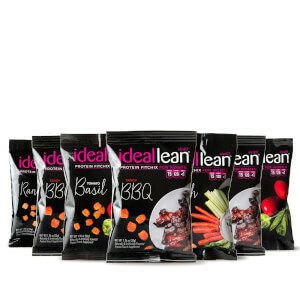 At just 110 delicious calories per serving, IdealLean Nighttime Casein provides 24g of slow-releasing protein to keep your muscles fed while you sleep. To optimize your sleep for even better recovery, we've also added 200mg L-Theanine to promote relaxation, helping you get an even better nights rest! So while you're dreaming of building lean muscle, our casein is at work making that dream become a reality. I purchased this when it first came out so there were very few reviews, I wish I would have known before wasting my money. The casein protein has a different texture than whey protein, but honestly, I expected that. I could get over some of the gritty texture if the flavor was good, but sadly, this flavor is severely lacking. I've forced myself to have 2 servings out of the entire tub. I will say I do love Ideal Leans other protein options and flavors, I use and love Carmel Mocha, Mint Chocolate Chip, Cake Batter, and Peanut Butter Cup...I had high hopes for this...not worth it! At first I didn’t like it... now I love it! The first two nights I tried this with water shaken hi before bed. It was gritty and foamy. I was not please at all. I was very disheartened bc I wanted to love it! I emailed customer service and they said the gritty taste and extra foam is normal for casein protein. One person said they love to mix it with ice cream. Now I eat this daily at lunch by making protein pancake, and before bed mixed with cottage cheese, chocolate chips, and strawberries!! I have also mixed with hot almond milk and it was good like that as well. I don’t think I’ll ever again put it in a blender bottle - but I will continue to enjoy it the other ways I have been using it! Overall - I’d recommend it! It's a bit too sweet for me. I've mixed it with just a bit of the peanut butter chocolate to take the edge off and I'm getting used to it. I love Ideal Fit and all of their protein powder, but the minute I shook this up it turned into what seems to be a glue-like substance that is grainy, and a very bad flavor. I so wished that my view on it would have been different than the other reviews so I decided to give it a shot as I am a big butter pecan gal, but I promise, it is not a good purchase. Will be returning, but I will always be an Ideal Fit customer!! I've tried it both warm and cold, in a shaker bottle, a blender, and using a milk frother, with water, milk, and almond milk, and I can't ever get it to the smooth consistency I've come to expect from other IdealLean protein powders. I'll be returning the product. I was really excited to give this a try. I really like adding a good casein into my evening routine. Unfortunately, I am really disappointed with this product. The flavor of the butter pecan is subpar in comparison to the whey proteins sold by idealfit. The butter flavor is overwhelming. The texture is somewhat gritty. I've tried mixing it in water, almond milk, and regular milk. Nothing has made it suitable to my tastes. I'm hoping I can just get through the rest of the tub without giving up on it and throwing it in the trash. The taste isnt really there. I knew it was going to be Thicker but just the flavor wasnt there it just had the protein taste.i was sad with the taste because I was excited to like it like the other flavors i get. I love the other proteins. Love caramel mocha, mint chocolate, birthday cake. I was really excited to see that IdealFit had started carrying casein protein, but I’m hoping the physical results are better than the butter pecan flavor tastes. It’s just meh... I’m not quite sure what it is, perhaps it’s too sweet? Or maybe it’s just the bar for taste was set so high with the Chocolate Brownie whey protein? With that I can sip it and it tastes like a yummy treat, whereas this is more of a chore to finish. Also, I’m a bit confused on the appropriate combination for mixing it. The directions say to use one scoop but the serving size is 2 scoops, so I’m not sure if that is a typo or if I just need to double the mix/water with the directions to get a full serving? The three stars is based purely on taste. Since I’ve just started using the product I can’t speak to the results.